FabricAID, NeMo, and Thinkerbell Labs Take The Podium at the 2018 Global Social Venture Competition Finals! FabricAID has created a system for collecting, recycling and redistributing second-hand clothes to marginalized communities. Clothes are aggregated, graded, sorted and cleaned to be sold through a number of distribution channels such as pre-existing second hand shops, markets and shops that FabricAID creates through a social franchising programme, or recycled to produce, for example the stuffing of mattresses. Learn more here! NeMo offers a low-cost, scalable, wearable device and a pre-programmed smartphone that empowers mothers and families living in rural areas to accurately and frequently monitor the vital signs of newborns at home and identify and assess danger signs. The pilot project has been conducted in Uganda. Learn more here! Thinkerbell Labs aims to help visually impaired students learn how to read, write, and type in Braille language through an all in one audio-tactile device that consists of hardware components such as a refreshable Braille display, a digital Braille slate, and a Perkins style Braille keyboard. Learn more here! In addition to the top three prizes, the Competition awarded three special prizes. In memory of Priya Haji, an impact entrepreneur and alumna of Berkeley Haas and GSVC, this award is given to the winner of the Challenger Round of the teams who did not move forward to the final round. Acarí is a US-based startup that takes the invasive armored catfish, or ‘devil fish’ as colloquially known in Mexico, and transforms it into tasty, nutritious food products to increase employment in rural fishing communities and provide a healthy, sustainable alternative to beef jerky called “El Diablito”. Learn more here! Voted by the attendees, Musana Carts — a solar powered carts for African street food vendors to improve hygienic and security conditions — was the audience favorite among the top 6 finalists. Learn more here! Also selected by the attendees, Konexio — offering ITC training to improve social inclusion and access to the job market for refugees and migrants — was the audience favorite among the 13 semi-finalist teams. Learn more here! 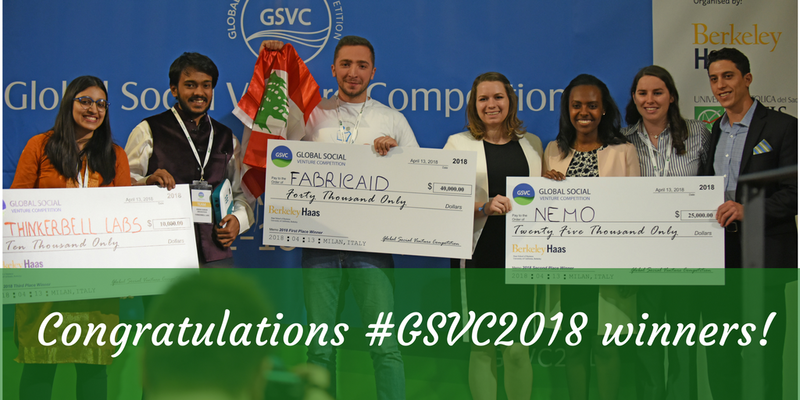 We congratulate the GSVC 2018 award winners and all of the 2018 finalist teams for their drive and inspiring solutions to solve some of the world’s most pressing social challenges. We look forward to charting your progress and success! Next year we celebrate the 20th annual Global Social Venture Competition and will be back at UC Berkeley in April 2019 for the Global Finals. Stay tuned for announcements about the 2019 application cycle and alumni success stories from our 20 years of impact! The Center for Social Sector Leadership inspires the next generation of leaders to achieve social impact across sectors. UC Berkeley is home to some of the greatest people, initiatives, and institutes working to have a positive social impact in the work. This page collects some of their stories.